In this tutorial, we will learn how to perform MVVM approach in Xamarin.Forms using Fresh MVVM. 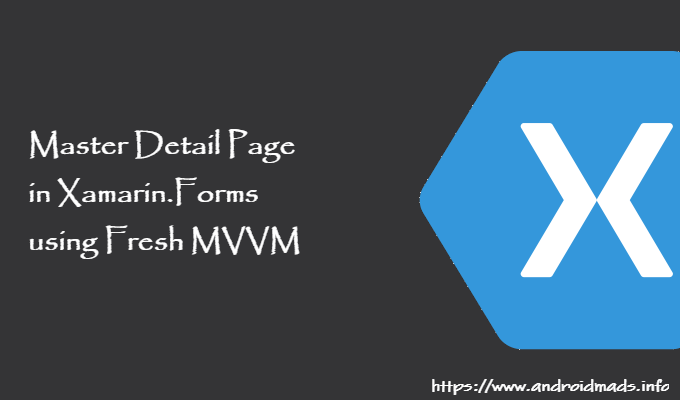 MVVM approach is the best approach for Xamarin.Forms and WPF Applications. There are a lot of MVVM plugins or libraries like FreshMVVM, MVVMCross, Prism, etc. available to simplify MVVM implementations. FreshMVVM is designed to perform MVVM easy and simple with Xamarin.Forms Application. It is created Michael Ridland. It has certain rules to perform MVVM Databinding. You can find the plugin from GitHub and Nuget. Kindly refer my previous article on Fresh MVVM to know the basics & rules of Fresh MVVM. I have split this part into 3 steps as in the following. Setting up the plugin for Xamarin.Forms Application. Create New Project by Selecting New -> Project -> Select Xamarin Cross Platform App and Click OK.
Then Select Android and iOS Platforms as shown below with Code Sharing Strategy as PCL or .Net Standard and Click OK.
We will start coding for Fresh MVVM. 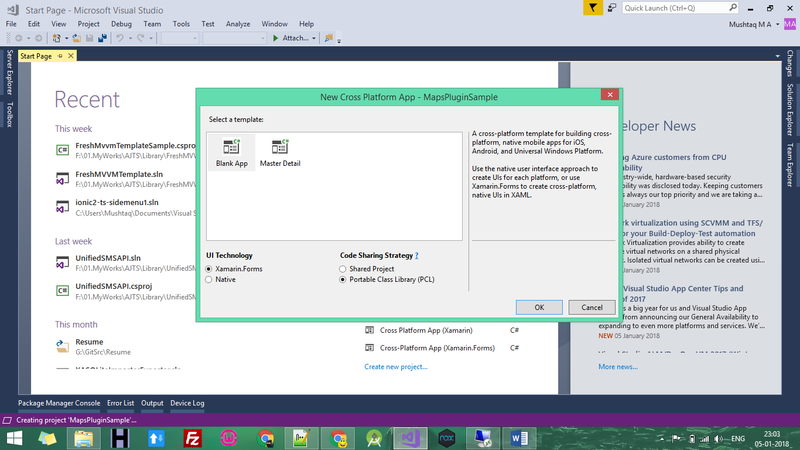 Create New Xamarin Forms Project. Open Nuget Package Manager against the solution and do search for Fresh MVVM Plugin or Paste the following Nuget Installation. Click Install to install this Plugin against your PCL Project or .NET standard Project. Step 3: Implementing Fresh MVVM. Create your XAML page (view) with name ended up with “Page”. 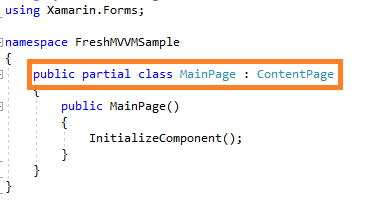 Create PageModel by create Class name ended with “PageModel” and inherited with “FreshBasePageModel” as shown below screenshot. In the same way, I have created two pages “Detail1Page” and “Detail2Page” with two respective page models “Detail1PageModel” and “Detail2PageModel”. To create Fresh MVVM Master Detail Page as MainPage, we should use Fresh Master Detail Navigation Container with the following code. 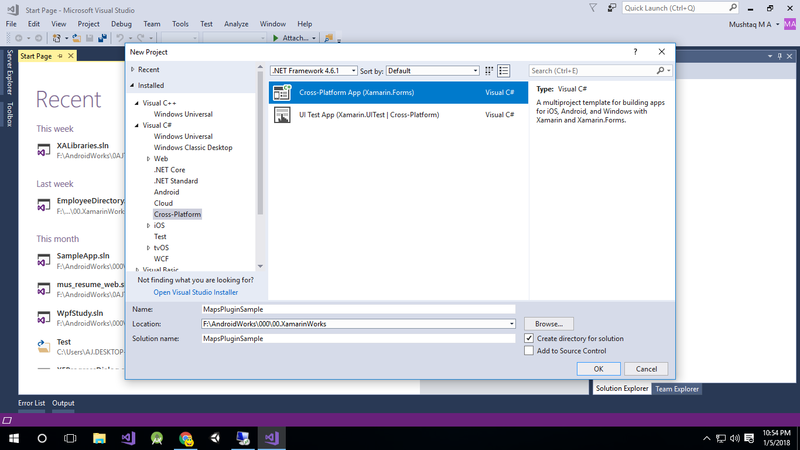 Open App.xaml.cs or App.cs and set MainPage. Here, we will not discuss about navigation between pages. 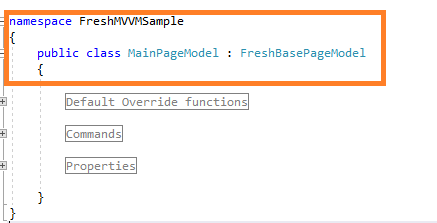 If you want to know, you can see my previous article on Fresh MVVM. You can download the code from GitHub. If you have doubt, feel free to post comment. If you like this article and is useful to you, do like, share the article & star the repository on GitHub.